Though we faced very wet weather, we were quite lucky because temperatures stayed above 40 degrees the entire time. We were supported by my girlfriend, Jess, on Saturday night, February 24th. She also provided us with a ride home. We started climbing Union Springs Rd. at about 8:30pm on Friday night, February, 23rd. 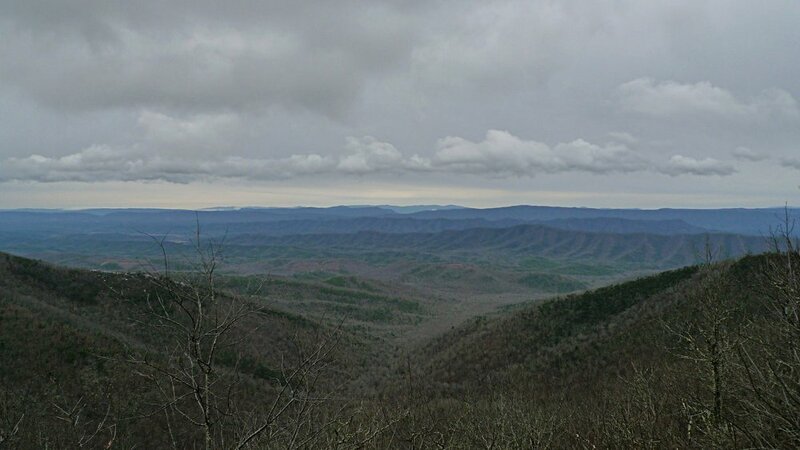 We ended up camping about 18 miles in, just before the descent off Reddish Knob on the Timber Ridge Trail (431). The climb up Union Springs is long, rocky, and sustained. It served as great preparation for things to come though. There’s an awesome piped spring once you begin to reach the saddle of Reddish Knob that we took full advantage of. Our goal for day one, which we somehow managed to meet, was to ride from there, 80 miles to the base of Little Mare Mountain Trail (714). There, Jess would have a hot dinner and a full resupply for the next day, Sunday, February 25th waiting. We left camp at about 7:30 am after a surprisingly dry, windy night and started down Timber. We fumbled for a while getting our bags adjusted through the first rock garden and learning the extra weight of our bikes. We moved relatively “steady” until we stopped to filter water on the North River. From there the route climbs up the Lookout Mountain Trail (716) following along the ridge to the top of Hankey Mountain. Lookout is a relatively short, but steady climb with some fine rock sections and big views east and west. Single track gives way to muddy double track to the top of Hankey. The descent down Dowells Draft (650) is fast and it felt great to descend on flowy, fun trail. We stopped at Braley Pond for a lunch break. There’s a little outhouse there, a parking area, and camping options. It would serve as a great place for support if need be. It was about 2:00 pm when we arrived. By this point a steady rain had started falling, so we stood under an info kiosk to stay dry. We filtered more water out of the small creek that feeds Braley’s. I felt slow and sluggish at that point. As we started the long climb up Bridge (442) and Road (448) Hollow the rain receded a bit and we climbed at an even pace to Confederate Breastworks. A tourist from out of state gave us a pile of cookies when we came rolling out of the woods onto 250. Lemon and chocolate chip to be exact. We tried to keep Jess posted with our ETA but service was spotty. It wasn’t until we got to the Shenandoah Mountain Trail (447) till we could let her know what was going on. By the time it got dark at about 6:10pm we had 13.0 miles left on the SMT to ride and the same amount of road to get to the northern terminus of Little Mare and, of course dinner. We had originally planned to meet Jess by 7:30 pm. We got to her at about 10:45pm. BEAT. I was right on the verge of hypothermia after a tough 2 hours. While on the SMT the steady rain turned to a downpour and thick fog stuck right to the ridge making it super hard to see. We rode well, just slow as we picked our way toward Scotchtown Draft Rd and the end of the SMT. This was, for me, one of the toughest times I have had while riding a bike. I had a tough time regulating my temperature while moving in the pouring rain with temp's in the 40's. When we got to Jess, I was a zombie. While we ate I stared blankly off into space. It felt amazing to take off all that wet clothes and climb into a dry sleeping bag. I instantly fell asleep. In the morning it was still raining. We waited till the downpour was a light drizzle before I even thought about deflating my sleeping pad and unzipping my bag. It was really hard to put all of our wet clothes back on and continue in the rain again. We thought long and hard about continuing…and long and hard about quitting. Lucky for us though, it was close to 50 degrees. We resupplied ourselves, got organized, and said good-bye to Jess. Tired, stiff, and a bit chauffed we rolled out of camp. Our goal for Day 2 was Covington. There we’d sleep and resupply for the final day. The climb up Little Mare is sustained and it took us a bit to warm up. The summit of Little Mare never really came. The trail reaches a few “summits” and then steeply drops down on a technical, brushy bit of singletrack and then climbs right back up towards the Homestead Skyline Dr. The HSD is really unique with magnificent views off to the east. The road was holding a lot of water and super soft so the miles came slowly. We took a break at one of the nicest vistas of the ride, just before the airfield. Just past the Ingalls Field Airport the road turns to pavement and then quickly turns left at Sandy Gap. The descent from Sandy Gap ( 637) is stellar. Definitely one of the highlights of the ride!!! From Smith Creek Rd. at the bottom of Sandy Gap the route climbs steep to the ridge on Middle Mountain. We took a quick sit down break on top of Middle Mountain to stretch out and hold us over till lunch down in Douthat State Park. We descended fast through an overgrown corridor of trail and headed for the north side of the lake for a much needed lunch break. We regrouped. Douthat has beautiful camping options, a restaurant, and a little camp store to pick up grab and go items. Everything was pretty much closed and shut off when we rolled through at about 1:30pm. We did manage to hit a soda machine that was working though!! Climbing out of Douthat was hard, but I was excited for the long straight ridgeline section of trail on Middle Mountain. Plus, I was buzzing from all the sugar I had just consumed. From the top of the ridge, there’s a pretty long descent to a recreation area northwest of the Clifton Forge Reservoir. We were feeling well and remained steady up to the top of Fore Mountain on the Fore Mountain Trail (473). At the top of the singletrack climb, which was one of my favorite climbs of the ride, the trail turns to double track. This section of double track rolled fast and we descended quickly to Dolly Ann Dr. to start climbing, yet again, up to Big Knob. It was starting to get dark at this point. We climbed with our lights off in a misty rain up Forest Rd. 1250 D which is very eroded, super muddy, and sustained. Between periods of spitting rain, the moon shined through ominous rain clouds lighting up the trail. The air temperature was warm and the bits of moon light that lit up the woods provided a fine atmosphere. We were tired and looking forward to food! The descent down Peters Ridge (471) was eroded and washed out and miles came much slower than we had hoped they would. We entered Covington at about 9:00pm. We grabbed a hotel room, ordered a pizza, ate some weird jalapeno poppers, and went to bed. In the morning we used the continental breakfast to carb-load and coffee up. Leaving the hotel I was tense. Riding the pavement section to Roaring Run Furnace felt so fast; however, despite the cold steady rain and huge dump trucks that passed us on our way up to the Rich Patch Mine. I was working through some knee pain and nervous about the outcome of the day. We kept steady conversation going the whole climb up to Rich Patch. I took a few muffins, some bagels, and some little mystery pastries from the continental breakfast that I looked forward to eating for a better part of the morning until I could no longer resist. The Roaring Run Furnace area (264), the climb up the Iron Ore Trail (5004), and the descent on Hope Hole (5001) was my favorite little linked section of the whole ride. The short pavement section after Hope Hole was such a nice break and moral booster, as well. Through Strom onto Craig Creek Rd. it began to feel like we were going to be able to complete the ride we set out to ride! We ate lunch on Rt. 5020 (O-I Road) a beautiful gravel road pushing us up towards Price Mountain. We tucked in underneath some white pines to block the rain and wind and mentally prepare for the climactic, yet extremely stout ending to our trip. Price Mountain was very challenging. The trail follows the direct path of the ridge, neither bench cutting or switchbacking one time. We both were stopping a lot to hike our bikes, and eat. Though it’s beautiful, I was so worked I had a hard time appreciating it. 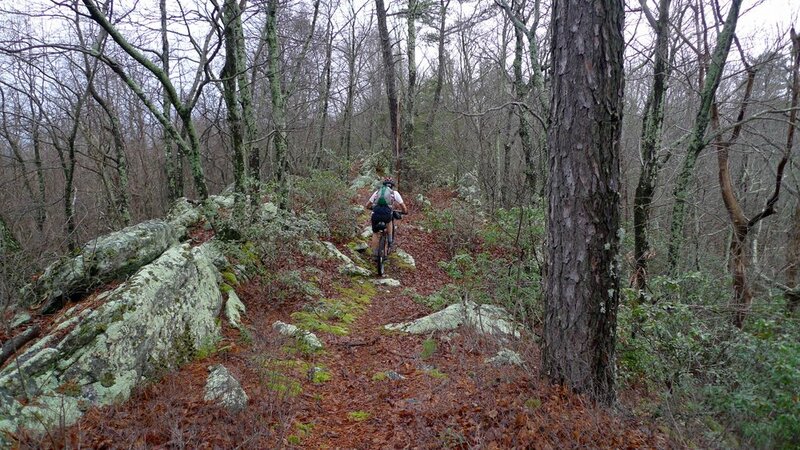 There’s a little bit of in between trail and gravel road between Price Mountain and the North Mountain Trail (263). I ate all the M&M’s and Swedish Fish I had left to prepare for the final 13 miles on the North Mountain Trail. We filtered water for the final time of the ride. As soon as we made it to the top of the North Mountain Ridge and began the long southerly push towards Rt. 311 the sun began to go down. The clouds had been breaking up and we got a beautiful sunset on top of the ridge. It was a great way to send off the ride in an epic place. The North Mountain Trail felt like a long 13 miles. The trail on Price Mountain and the North Mountain together, are huge obstacles and a section of the RTR that will be memorable for every rider. The descent off of North Mountain to 311 is one of the finest downhills on the ride. We met Jess on Rt. 311 at about 9:00 pm on Monday, February 26th. We were so spent, I hardly had the energy to remove the axle from the front wheel to get my bike in the van. We ate a bag a chips and fell asleep till we got back to Harrisonburg. We both had to be back at work on Tuesday. 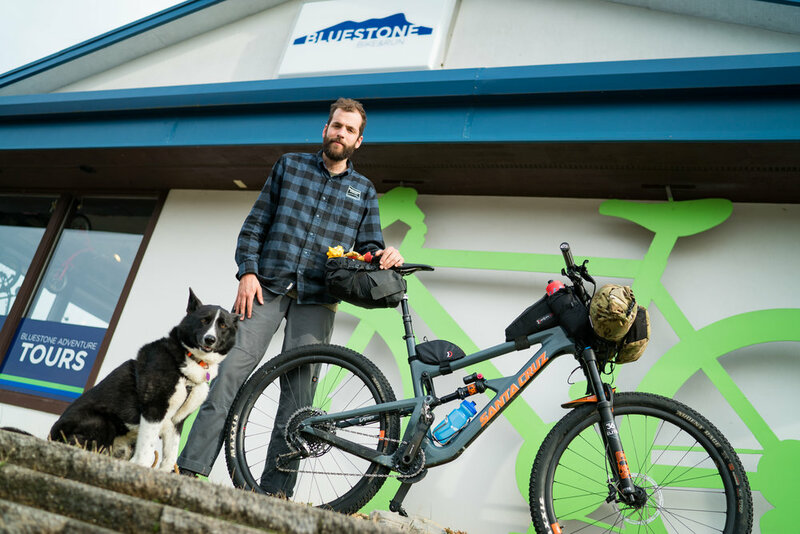 Charlie and I rode 200 miles, averaging about 7 mph, climbing roughly 8,000 feet each day . We worked well as a team and kept the mood light when we could. We did a good job of keeping our negative energy to ourselves and staying positive in really tough times. We were sufficiently worked by the end of the ride. Both of us are proud to have linked such a tremendous amount of trail together. As always we were quite humbled by the George Washington National Forest's relentless nature. I’m really looking forward to the race in April and eager to see how many folks set out to ride this gem of a route! Hats off to Rob Issem and the folks down in Roanoke making moves, to Charlie and I’s home community of Harrisonburg, and to all the folks in between who may have helped to make this route possible.